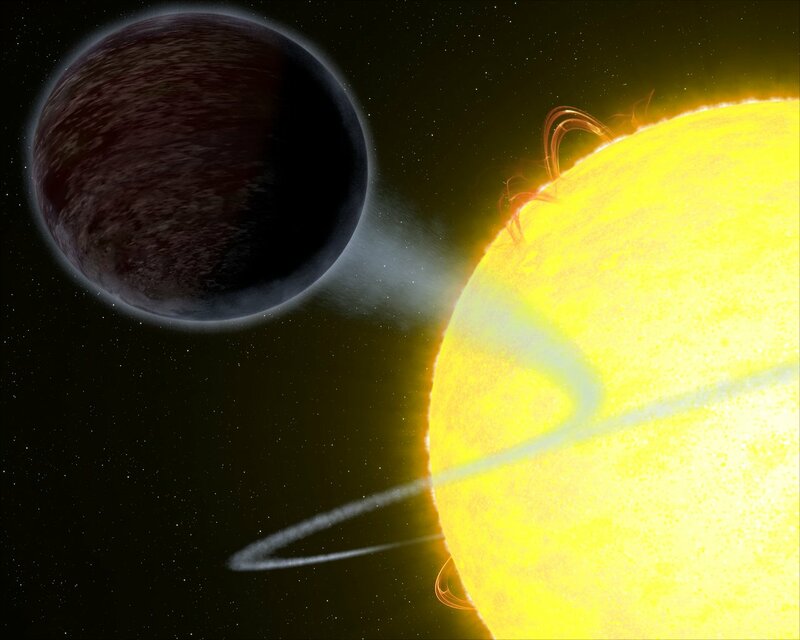 Astronomers have discovered that the well-studied exoplanet WASP-12b reflects almost no light, making it appear essentially pitch black. This discovery sheds new light on the atmospheric composition of the planet and also refutes previous hypotheses about WASP-12b’s atmosphere. The results are also in stark contrast to observations of another similarly sized exoplanet. Using the Space Telescope Imaging Spectrograph (STIS) on the NASA/ESA Hubble Space Telescope, an international team led by astronomers at McGill University, Canada, and the University of Exeter, UK, have measured how much light the exoplanet WASP-12b reflects — its albedo — in order to learn more about the composition of its atmosphere . The high temperature is also the most likely explanation for WASP-12b’s low albedo. “There are other hot Jupiters that have been found to be remarkably black, but they are much cooler than WASP-12b. For those planets, it is suggested that things like clouds and alkali metals are the reason for the absorption of light, but those don’t work for WASP-12b because it is so incredibly hot," explains Bell. “After we measured the albedo we compared it to spectral models of previously suggested atmospheric models of WASP-12b”, explains Nikolay Nikolov (University of Exeter, UK), co-author of the study. “We found that the data match neither of the two currently proposed models.” . The new data indicate that the WASP-12b atmosphere is composed of atomic hydrogen and helium. The team measured the optical geometric albedo of WASP-12b, which measures the light that is scattered back towards the source of light, and can have values above 1. This is in contrast to the Bond albedo, which describes the total amount of energy reflected across all wavelengths and always falls in the range of 0 to 1. Earth has an average optical geometric albedo of about 0.37. Enceladus, an icy moon of Saturn, has an albedo of 1.4, the highest known albedo of any celestial body in the Solar System. One proposed model was an aluminum-oxide atmosphere with Mie scattering while the other was a cloud-free atmosphere with Rayleigh scattering. The international team of astronomers in this study consists of T. J. Bell (McGill University, Canada), N. Nikolov (University of Exeter, UK), N. B. Cowan (McGill University, Canada), J. K. Barstow (University College London, UK), T. S. Barman (University of Arizona, USA), I. J. M. Crossfield (University of California Santa Cruz, USA; Sagan Fellow), N. P. Gibson (Queen’s University Belfast, UK), T. M. Evans (University of Exeter, UK), D. K. Sing (University of Exeter, UK), H. A. Knuston (California Institute of Technology, USA), T. Kataria (Jet Propulsion Laboratory, USA), J. D. Lothringer (University of Arizona, USA), B. Benneke (Université de Montréal, Canada), and J. C. Schwartz (McGill University, USA).